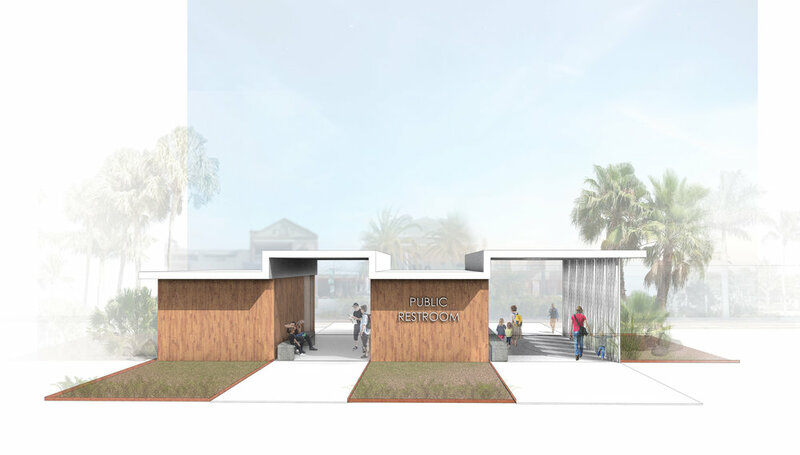 The design for the St. Armands Public Restrooms addresses a need that the community has had for public facilities for over thirty years. 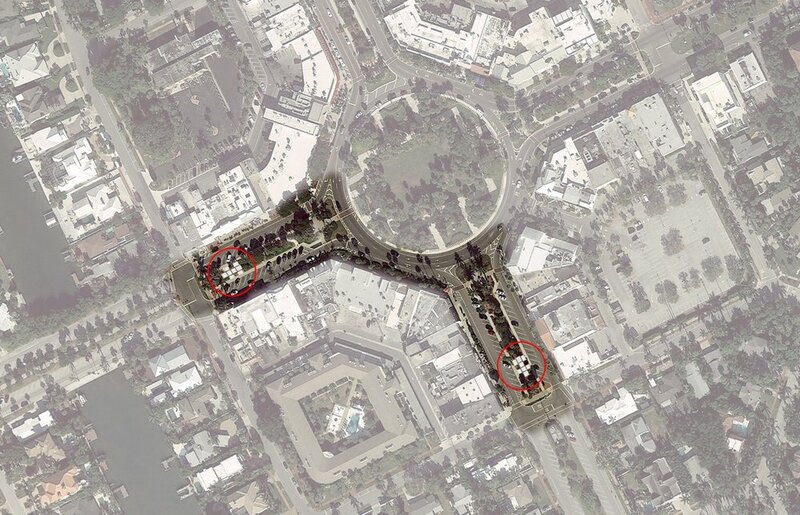 The Land Owners, Merchants, and Residents committee (LMR), which represents the various stakeholders of St. Armands Circle, proposed a design brief that called for two sets of public restrooms on the circle. After the committee exhausted efforts trying to find a prefabricated option that was both functional and aesthetically appropriate for the community, they approached SOLSTICE to propose a custom design solution. As a product of our meetings with the LMR, we discovered some additional opportunities for improving the area through our design. The first was that we found that the medians that run along John Ringling Boulevard and Boulevard of the Presidents had become visual and physical barriers for pedestrian flow. These medians had created a separation between the businesses located on either side of the road and presented an opportunity to reconnect the two sides of the street and promote pedestrian travel from one side to the other. We addressed this opportunity by separating the two bathroom units to create public space in between. Large public sidewalks flow through these spaces connecting the sidewalks on both sides of the medians. The second opportunity was to provide a shaded place for sitting while either waiting for someone or for taking a break as you walk to and from the beach. A single piece of white precast concrete spans across both restroom units and the adjacent paths to provide shade from the intense daytime sun. The precast concrete benches placed along these paths provide a shaded place to sit. Another challenge the brief requested was creating a design that addresses the issues of building in a flood zone while also creating a structure that is robust and durable enough to withstand the harsh gulf front environment. Our design tackles these challenges by utilizing precast concrete and modular components. Another benefit of the precast construction is that once the components are cast offsite, they can be erected onsite in one day. This method minimizes the downtime of adjacent sidewalks and parking spaces and prevents loss of revenue from nearby businesses.